It’s been a little bit of a pipe dream of mine to take off behind the wheel of an old VW camper van. A couple of years ago a friend posted some pictures of their weekend travels through Yorkshire in an orange Type 2. I enquired where they got the van from and they pointed me in the direction of Liberty Campers. I decided to take the plunge for this years summer holiday with my nine year old daughter and take off in a T2 to Wales. I contacted John at Liberty Campers and booked ‘Dougal’, the very same camper my friend hired, for the trip. John explained that Dougal was a newer Type 2 with a water cooled engine that tend to be more reliable on a longer trip. Don’t be fooled into thinking it’s a modern vehicle, it’s not. Other than the engine nothing has really changed and you are still driving a vehicle that made it’s debut in the late 1960’s. As John pointed out motorways hadn’t been invented when the VW camper van was first conceived. On the day of departure my daughter and I drove over to meet John and Dougal in Ilkley where they are based. John is obviously an enthusiast. He maintains and restores his own vans and is keen that people get a sense of what heading out in a Type 2 is all about. It’s not about caning it down the motorway, a comfortable cruising speed is around 40 or 50 mph. It’s about slowing things down, finding the back roads, taking in the scenery and enjoying the ride. John showed us round the van and explained the equipment. Dougal comes with a pop-up roof where my daughter excitedly wanted to sleep, a small fridge, a two ring gas stove and grill, sink with running water, CD player with an iPod/Aux connector, an electric hookup, kettle, heater, cutlery and cooking equipment. The back seat folds out to make a bed for the grown ups. The fridge, water pump and interior lights work off a separate 12 volt leisure battery that is charged as you drive so you don’t need to worry if your campsite doesn’t have an electric hookup. You can also charge your phone off it! On our 10 day trip we only managed to hookup on two nights and it wasn’t a problem at all. After our introduction we set off on our adventure to Wales. Driving takes a little getting used to but after a few miles you start to get familiar with it then it’s big grins all the way. You don’t have the luxury of power steering but there is something satisfying about turning the big old steering wheel. The gearbox is the same after you get used to it. It has four forward gears and a long gear stick and the gears pop in with a gratifying clunk. The handbrake is on a ratchet in the dashboard just above the gear lever which takes a bit of getting used to as well. Once you are used to it, however, it’s a pleasure to drive as you bimble along twisting winding roads waving at other VW campers coming the other way. Allow a lot of extra time for your journey as you’ll want to pull up at the side of the road or stop off at a picnic spot and put the kettle on and wonder why everyone else is in such a rush. 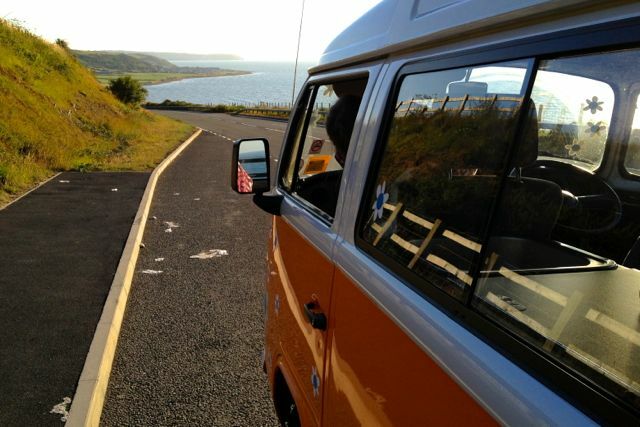 In a camper van it really is about the journey not the destination. We took Dougal down through Welshpool to Cardigan then up through Snowdonia and back along North Wales. Parked up near the beach or driving along coastal roads and mountain passes it was sheer pleasure and relaxation. The van was a real talking point and even my daughter was bringing her campsite friends over to have a look at it. During the day we’d drive out to the beach or head off to the local sights or just go for a drive. On an evening it was nice just sit to sit in the van with the sliding door open with a book and a glass of wine watching the sun go down while my daughter ran off with her new found friends. On quieter evenings we’d sit in the van and play with the travel board games we’d brought. There was no need for television or computer games. I know this review seems somewhat biased but it’s hard to fault taking to the road in a piece of 60’s nostalgia. If you are expecting all the comforts of home you are missing the point somewhat. This is all about leaving modern life behind, winding down and taking your time and we both loved it.